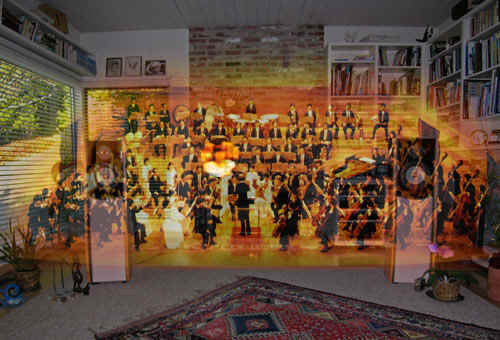 It is possible to reproduce a stereo recording in an ordinary living room such that listeners have the illusion that the two loudspeakers have disappeared. When they close their eyes, they can easily imagine to be present at the recording space, as they listen to the phantom audio scene in front of them. The vast majority of loudspeakers that have been sold - the typical box speakers - can only produce this effect to a limited degree because of a fundamental limitation: they radiate sound into the room with different intensity at different frequencies and angles, though they measure flat on axis. Consequently the many reflections from room surfaces are sonically colored in a way that is characteristic for box loudspeakers. We always recognize the sound as coming from a box rather than being live. It is the generic loudspeaker sound. Loudspeakers with frequency independent, constant directionality such as omni, dipole or cardioid loudspeakers, cause reflections in a room that are essentially delayed replicas of the direct sound and which are therefore less colored. Your ear/brain perceptual apparatus does not get confused by sound replicas. Instead it compares them to the familiar acoustic behavior of your room and readily blankets the redundant information and thereby the room. This automatic brain response is related to the Precedence Effect in psychoacoustics and is essential for creating the illusion of "being there" by withdrawing attention from the living room acoustics. It has been a fascinating journey for me to come to this understanding. Early on, electrostatic panel loudspeakers had intrigued me, because they seemed to do something fundamentally right when properly set up, and this despite their obvious limitations. I can see in hindsight that a few loudspeaker designers had pointed to the benefits of omni-directional loudspeakers. The ORION+ has demonstrated to me what more is possible in 2-channel sound reproduction, provided that the recording contains natural spatial cues and is not merely an artificial sound mix. Accurate sound reproduction is in reach for you too. Surprise yourself with the believability of the illusion when two loudspeakers properly stimulate your room, ear and brain. You find yourself lost in music and space. 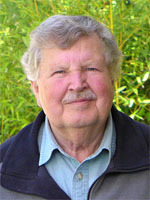 It is a difficult process to capture and reproduce a sonic event to such a degree of accuracy that a listener would have a similar experience when present at the original and at the reproduction of the event. In the case of a live event, we perceive the artistic performance as it is influenced sonically by the hall or auditorium and its acoustics, by our own state of being, by the response of the audience, and by our physical location within this environment. When it comes to reproducing the original artistic performance for later playback there are two schools of thought. One contends that it is acceptable, may be even desirable, to alter the original in the path from recording to playback for maximum emotional impact, arguing that it is impossible - to begin with - to replicate the original. The other tries to minimize any such changes in order to deliver faithfully what the artist and producer tried to communicate. Music has the power to uplift our spirit. It has been passed on to us by its composer and we experience it through the play of the musicians. Their performance and artistry can bring us in contact with much beauty and move us deeply. I do not understand how it happens, but when it was a great performance everyone in the audience knows it and wants to applaud enthusiastically. To the degree that it has been possible to capture and store the sound of such event, it should be possible to reproduce it in all its dynamics, subtleties of expression and tonal range without adding, removing or falsifying any part. Then we can hope to re-enact for the listener, in the quiet of his living room, a semblance of the original event and allow for a most immediate experience of the music. My goal is to design transducers that convert electrical signals into sound without adding or deleting information, with minimum masking by the listening environment and based upon what is perceptibly significant. The loudspeaker is only one element in the reproduction chain of tools, but it is the weakest link and determines ultimately what you will hear and experience. Many other elements have the potential to change the sound of the original artistic performance significantly and permanently. As consumers we must take what has been encoded in the storage medium to be the intended original. In most cases this is far from what you would have heard at the live event. An accurate loudspeaker, though, can tell you a great deal about the recording venue, microphone technique and processing in the control room, provided that you still recognize the characteristics of live sounds. Not only the loudspeaker but all the other pieces of equipment that are used for the playback of a recording can have significant influence on what we hear and experience. I list them in decreasing order of their typical contribution to altering the original, including some that I consider obsolete. The alteration or distortion of an original can be additive and/or subtractive in its effects. Some low level non-linear distortions give the impression of enhanced sonic detail, like enhanced contrast in a photographic image. Other types tend to round off and smooth the edges and make the original sound less aggressive. Silent spaces between the notes become filled in. Or, the timbre balance may be warped, emphasizing particular regions of the sound spectrum. The damaging result of perceptible alteration is an overriding sameness of presentation that removes any sonic surprises. The following table shows the contributing mechanisms in decreasing order of significance. It is difficult to describe the quality of a sound reproduction system in words, unless there is some agreement on the vocabulary. A list of terms which was published by Pro Audio Review magazine a number of years ago should be helpful in any discussion. Are they HERE or are you THERE? When you listen to your loudspeakers do you have the illusion that the performers are in your living room, or do you feel transported to the recording venue? The clarity of your speakers, how uniformly they bathe your room in sound, the talk-back of the room, and most importantly the spatial cues imbedded in the recording itself, they all influence whether one or the other of those illusions forms in your mind, or whether there is little sense of a definable acoustic space at all. Recording is a difficult process, more art than science. 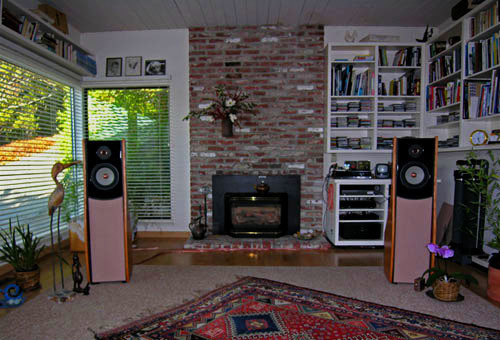 Though a large body of science and best practices exists many "recording engineers" seem to have insufficient knowledge of how their various takes on reality might be perceived and appreciated when they are reproduced by a highly accurate loudspeaker system in the living room. Many times I have wished that I could set the producer of a particular recording into my listening chair and ask him: What were you trying to accomplish? Let me illustrate some recording practices. 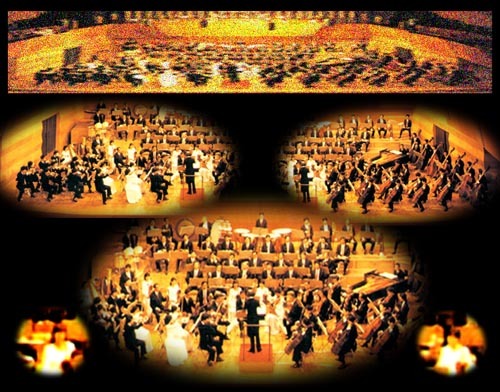 Below is the photo of a symphony orchestra with green dots that represent possible microphone locations. Those microphones might be 3 spaced omni's for the main orchestra, 2 spot microphones, one for each soloist, and a microphone hung up high to pick up hall reverberance. So here are 6 microphones ready to sample different acoustic images produced by the orchestra and venue. 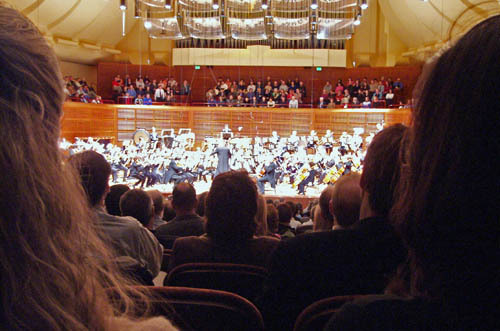 I have counted as many as 40 microphones flown over the musicians of San Francisco Symphony orchestra. 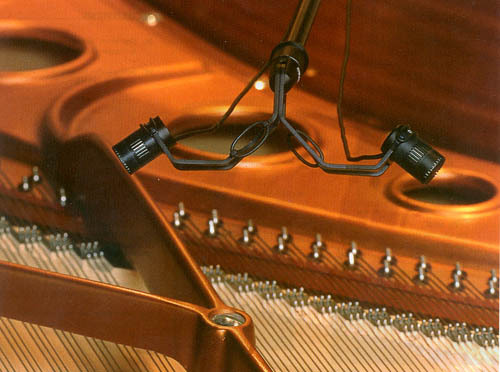 Some recording engineers will limit themselves to two coincident or nearly coincident microphones for the orchestra and one for the hall. Different recording companies use different microphone setups and you will discover your preferences. In the above example we have 6 microphone output signals that need to be combined to produce left and right channel signals for 2-channel loudspeaker playback. The hall microphone is probably mixed into L and R equally, though at low level. The two soloists will be panned to the phantom center and the orchestra faded down when it is their time to perform. I hate it when the piano slides acoustically forward and backwards in a piano concerto recording. Besides, the sound of the piano is nothing like what I am familiar with when the stereo microphones are placed under the lid, close to the strings and then fed to left and right channels. The mixing and mastering engineers and the producer decide on the mix-down of the various recorded microphone channels to a 2-channel format. 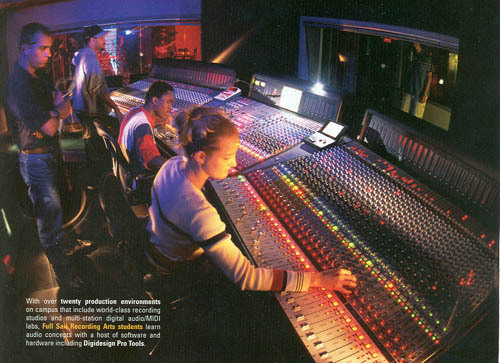 There are plenty of faders, compressors, limiters, equalizers, flangers, reverberators, etc. available to them to express their artistic preferences, please the musicians, or to maximize broadcastable volume level for commercial success. Fortunately classical recordings are spared some of this treatment. The vast majority of recorded music, though, has undergone this mutilation so that nothing of it will be masked by the background noise inside a car, or by the street noise getting past the iPod ear buds. Typically this results in 10 dB to 20 dB of recorded dynamic range, not surprisingly this is often the visible display range of a digital workstation, and it can be turned up to a uniformly high volume level to drone out the rest of the world. So now you take home the CD or LP that you just bought to play it through your sound system. The room is quiet. The remote volume control is on hand for setting a realistic volume level with your eyes closed. No one is going to interrupt your listening session. What do you hear? What images form in your mind? What memories are triggered? Can you get lost in the music and forget about speakers, cables, amplifiers and all that stuff that is supposed to do something wonderful? Are they here? Sometimes. Am I there? More often. Other times it is a kaleidoscope of sounds, instruments and voices appearing in space but not in a continuum of space. The soloist in the symphony may appear disproportionately large in size compared to the orchestra. When listening from the "sweet spot", the conventional stereo seat, then spatial cues determine the illusion. Even though I can point to the soloist in the center and have a clear image of her location in my room I cannot help but think that this is how she sounds at 4 inch from her mouth, where the microphone was. Thus to me the illusion is more often one of 'being there', where 'there' is the microphone location. Now with the general practice of close miking this is not what I am used to hear from an audience seat. It makes it also difficult to judge the absolute performance of a loudspeaker when using commercial recordings. I strongly advise to listen to a large variety of such recordings before drawing conclusions. The more accurate the speaker, the more it tells about the recording and the less about itself. The observations about 'being there' hold whether I listen to the ORION or near-field to the PLUTO. Since PLUTO is an almost perfect acoustic point source it has slightly sharper image focus, but the sound stage depth behind the speakers is less. Both sound equally open and disappear on recordings that have captured a realistic sense of venue space. Still, some say that the ORION is more engaging which I attribute to its greater dynamic capability. The sense of 'being there' can be so strong that all else fades and the sound launches a deep experience. Now moving away from the sweet spot and further into the room, the illusion of 'they are here' becomes stronger given the right recording. A lot of my listening is from a greater distance. For test purposes I like to go down the hallway or listen from another room, even from behind a closed door, to tell how strongly the speakers convey the sense that someone is really here, singing in the room, playing the piano, a whole band working it up. This is where dipole or omni-directional speakers perform vastly better than the typical box speakers. It is due to their more uniform polar or power response. Given the vagaries of commercial recordings with their multiple microphones and mix-downs I had found it necessary to do my own recordings using a head related 2-microphone setup. These were strictly for test purposes. They showed me that the illusion of 'being there' is readily obtainable with my speaker designs. The only problem with those recordings is the fact that they pick up sound from all directions, front, back, sides, above. When played back over two loudspeakers all this sound now comes at me from the front. The person coughing behind me in real life now coughs in front of me out of the loudspeaker. There is too much hall sound. The ear/brain system has this wonderful capability of tuning all this out during the live performance and, for example, does not even notice the air duct noise. Once recorded and mapped to the front it is all there to distract me and I cannot easily tune it out anymore. Thus recording engineers must make trade-offs. The art is in finding those trade-offs that do not destroy the illusion that the recording is supposed to generate.